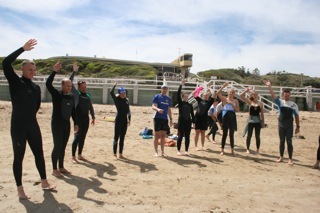 UP to 70 keen surf lifesaver participants took part in Ocean Grove Surf Life Saving Club’s first bronze medallion re-qualification earlier this month. Ocean Grove SLSC president Steve Peatling, who took part in the bronze re-qualification, said it was a fantastic turnout from the club and other nearby surf life saving club members on 8 November. “It was well attended on the day, I think we had numbers of around 70 people,” Peatling said. Participants applied first aid, conducted tube and rescue water activities and completed a 400 metre swim and prior to the day successfully finished an online test.